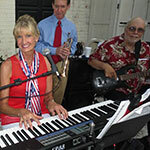 Cheryl Christine is the former owner and performer of LeCabaret Piano Bar on Hilton Head Island. Though she doesn’t realize it, Cheryl still has her Minnesota accent. It certainly doesn’t show up in her voice when she delivers a song from her ‘songbook’ which includes everything from the Big Band era to Rascal Flatts and Lady Gaga. Cheryl received a toy piano for Christmas when she was 4 years old and she’s been playing music ever since! The piano lessons started at age six with tutors from St. Josephs Academy in St. Paul, MN. Although classically trained, Cheryl could play by ear from the very beginning. At age eight she began to play the flute, and throughout junior high and high school, Cheryl competed in district and regional competitions, winning the highest merit for classical flute solos and duets in her Jr. and Sr. years. She played flute for the Youth Symphony in St. Paul MN., as well as baritone sax in the high school concert and stage bands. After attending Lakewood Community College in Mahtomedi, MN and Hamlin University, St. Paul, MN (for some music theory classes), Cheryl began teaching for Wurlitzer Co., and selling pianos and organs. Nice enough, as a day job, but “restlessness and youth” took her in another direction…performing! Although she had played in some rock bands in her teens, Cheryl began to develop, in musical terms, her multi-lingual talent at CC Richards Supper Club in White Bear Lake, MN., just north of the Capitol. Cheryl was 23 yrs old at this time and had never sung solo in public…this was the springboard of traveling, entertaining, recording - really finding herself in her music. During the 1980s, Cheryl signed with Comstock Records – recorded at Tom T. Hall’s Recording Studio in Nashville. She charted Top Ten in England on the Peugeot Playbill and in the Independent Country Charts in the U.S. with her own compositions and recordings. She toured Europe three times in that decade, especially Sweden, where she developed friendships that survive to this day. Cheryl has lived in the Hilton Head/Lowcountry area since 1987 – you might say she has grown up here. She is a cancer survivor, caregiver, plays at charitable functions for Alzheimer’s (her mother died of Alzheimer’s disease), and supports charities for the ASPCA and the Humane Society. "I just wanted to thank you for recommending Cheryl for my parents 50th wedding anniversary. I can't begin to describe how wonderful the trio was and that it really set the tone for a wonderful evening. They were so personable and professional. They were really able to read the crowd and I think everyone at some point was dancing!!" "I just wanted to drop off a note to you and tell what a fantastic evening we had with Cheryl and her Trio. She really "wowed" the entire group of 152 people. People for this event usually leave immediately after the event but people stayed to the very end of the evening; a first for us!! Comments stated that we should always use Cheryl for future events and I couldn't agree more. Cheryl is an absolute dream! So beautiful and so personable."